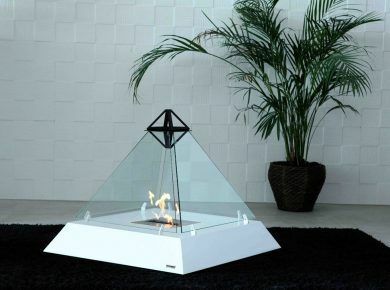 Take a look at cozy Vigo tabletop fireplace completing those lazy, cold winter days. The piece’s dual stainless steel burners run on Moda Flame ventless ethanol fuel, so no electricity, gas, chimney, or gel cans are needed. Glass panels on both sides provide a full 360 degrees of fire visibility. The Moda Flame Vigo fireplace is not designed to heat but more rather a decorative small fireplace. However, it does produce 3,900 BTU’s of heat as it is a real flame fireplace. If you like it – you can but it here.